On Sunday 26th & Monday 27th February 2017 we attended the beauty show of the year, Professional Beauty London. Our eyes were dazzled by girls sporting glitter lips, as we wiggled through the crowds to don the newest in lip plumpers that tingled and enhanced our smiles. We stopped to stare at the nail polish stands with the mecca of nails being at the OPI stand. We stopped to be, scrubbed, buffed, smoothed and rejuvenated by lotions and the newest in potions. We had a cheeky pit-stop to be massaged, leaving us in complete relaxation (research honest!) We watched on as brows were preened, buffed and highly defined and we saw the latest techniques in micro blading. During this process we saw one man have his confidence restored by having the crown of his head transformed with the application of micro blading. Beyond joining the swarms of beauty buyers, lovers and trend setters, we did do some serious work, we promise! But after all, work is not work, especially when you love what you do. So onto the real 'work' our resident Marketing Guru Angie Petkovic held a jam packed seminar on 'Maximising your White Space' for salon owners and therapists. We absolutely loved answering individual questions of real business pain points and giving our expert advice on how to manage. As usual with a packed room we didn't have time to answer all the questions, so if you missed the talk or couldn't get a ticket, please email info@aptmarketing.co.uk for a copy of our 'Maximising your White Space' leaflet. We are always on the look out for new products and we weren't disappointed. 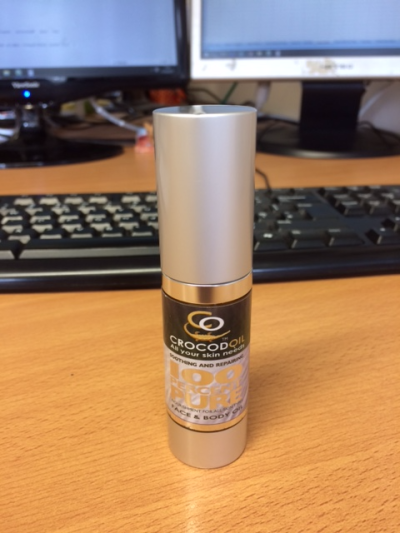 Our favourite was by far the newly launched Crocodoil who made their debut at the show! We managed to have a chat to the founders, Lloyd and Barbara Bantleman, who gave us some background on the product. Crocodile oil has been valued as a skin enriching oil for centuries by many ancient civilisations such as the Egyptians and Chinese. We were astounded at how this completely natural product left our hands silky smooth. You can purchase samples on their website for around £6.99, we would highly recommend trying this amazing product!